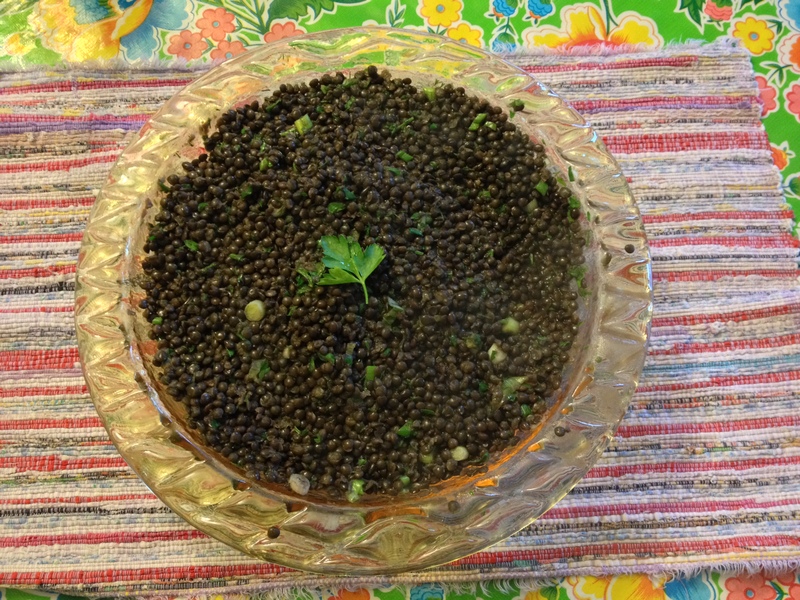 Black Lentils, not the French Green ones, different recipe too, but this picture is a teaser for the next recipe….Black Lentils with Fresh Herbs. It’s best if you soak the lentils overnight, but not necessary. Use organic small green French lentils for the best results. Wash the lentils, at least five or six times, running them through your fingers so the dust and stuff really comes off. Sauté up a bunch of onions, carrots and celery in olive oil. Don’t add the celery and carrots until the onions have cooked for a while. Add salt and ground pepper. Add lentils, without water and stir them around in the pot for a minute or two. Add a few cloves of garlic, pressed, cook this way for another minute. Then add water to cover the lentils, or a little more than cover. Don’t forget to add a bay leaf. Bring to a boil, stir and cover and turn the heat down to a simmer. Check in about 15–20 minutes. Then add some balsamic vinegar, more salt and pepper or water depending on the flavors. You can also add ground cumin, fresh or dried oregano and thyme. This is a recipe that actually doesn’t require many spices, but won’t be hurt by adding more either. Mirin or red wine is good too if you don’t have balsamic, but the balsamic is the best. A variation is to add chopped tomatoes or a can of tomatoes. This makes it more hearty and soup like. You can have your lentils more like a soup by adding more water and not letting it cook down or be absorbed by the lentils, or you can have them more like beans and let the water cook down. They are done when soft. This can take anywhere from 20–40 minutes depending on your lentils. That amount of time relates to post boiling. Serve with rice, cheese, hot sauce, feta or whateva!